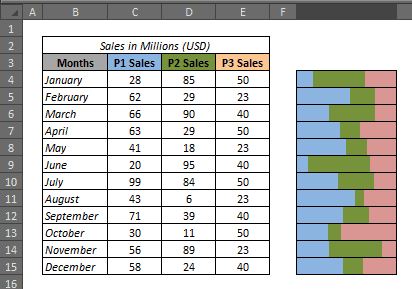 A colleague asked me if there was a way to create a dynamic in-cell 100% stacked bar chart in Excel for three product sales. As usually is the case, there were thousands of rows of data. There is no way she could have used Excel in-built charts as that would have taken her ages to create charts for each set of data points. This got me thinking, and fortunately, conditional formatting came to the rescue. I was able to quickly create something neat that fits the bill. Suppose you have sales data for 12 months for three products (P1, P2, and P3). Now you want to create a 100% stacked bar chart in Excel for each month, with each product highlighted in a different color. First, you need to calculate the percentage breakup for each product for each month (I was trying to make a 100% stacked chart remember!!). Select 100 columns and set their column width to 0.1. Select these 100 cells in the first data row (K4:DF4) in this case. 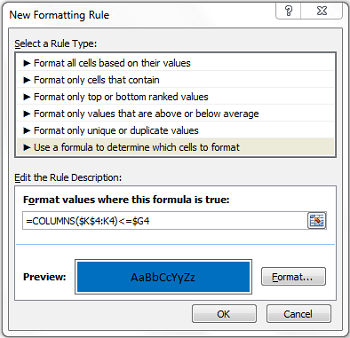 In New Formatting Rule Dialogue box, click on ‘Use a formula to determine which cells to format’ option. Now again select the same set of cells and go to Home – Conditional Formatting – Manage Rules. 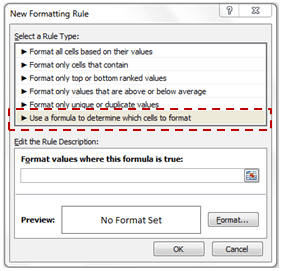 Click on New Rule tab and again go to ‘Use a formula to determine which cells to format’ option. Now put the formula mentioned below and set the formatting to green color. And finally again repeat the same process and add a third condition with the following formula and set the formatting to orange color. Hide the helper columns, and you have your dynamic 100% stacked bar chart ready at your service. 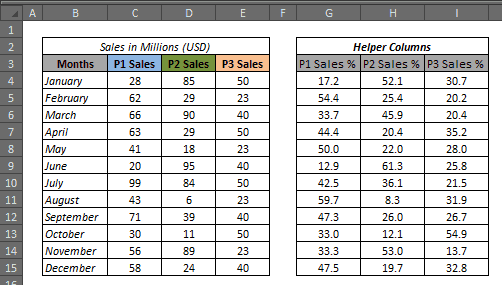 Creating a dynamic Pareto Chart in Excel. Creating Heat Map in Excel Using Conditional Formatting. How to Quickly Create a Waffle Chart in Excel. Is there a quick way to “select 100 columns”? Can you help me understating the Formulas and the results — I am not getting the logics and not the reaching the solution too. I need a stacked data bar that is in-cell. Doesn’t need to be 100% Can you help? Can you explain the COLUMNS function a little bit, please? Why do you start at row 9? Really cool idea and implementation! Thank you for an excellent written tutorial! I was wondering if this can also be realised when you have more than 3 ‘Sales’ columns. Would you happen to have an example with 5 or 7 cells? Thanks a lot! Thanks Candrex. Glad you like it. This would work more than 3 columns as well. You can follow the same process with 5 or more columns, where you will have to put in 5 (or more) conditions with different colors. I don’t have a ready format for more than 3 columns, but if you get stuck, feel free to comment and I can help you out.